If you want to download blip videos from www.blip.com, but do not know how, then this the article for you. In this article, we will teach you how to download blip videos with Bigasoft Video Downloader Pro for Mac. Blip (formerly blip.tv) is a media platform for web series content and also offers a dashboard for producers of original web series to distribute and monetize their productions. The company was founded on May 5, 2005, and is located in New York City (where the headquarters are based) and Los Angeles. It was financed by Bain Capital Ventures, Canaan Partners, and Ambient Sound Investments. Blip's mission statement is "to deliver the best original web series to audiences across multiple platforms." The site showcases a wide variety of dramas, comedies, arts, sports and other shows. Why do We Choose Bigasoft Video Downloader Pro to Download Blip Videos? First, it is powerful. It ensures successful and fast download of blip videos. Not only being able to download blip videos, Bigasoft Video Downloader Pro can download from almost all popular video sites websites such as tv.com or MySpace, Crunchyroll, BBC, Discovery, NBC, Youtube, or Dailymotion, Vimeo, Goear music, Metacafe, Break, Veoh, Ted Talk, Udemy and more. Second, it is also a video converter. If the video you downloaded cannot be played on your device, no worry, you can even use Bigasoft Downloader Pro to convert the videos to any format that can be played on your Windows,Mac, iTunes, QuickTime, Apple TV, iPad, iPod, iPhone, Kindle Fire, Android and more. Third, it is each to use. All you have to do is three steps to download the blip videos. How to Download Blip Videos with Bigasoft Vdieo Downloader Pro? Second, three steps to download Blip videos with Bigasoft Video Downloader Pro. Step 1 Add the URL of the Blip videos you want to download. Tip: Tip: If you want to download the video (only one) that are watching, Bigasoft Video Downloader Pro will capture the URL automatically. But if you opened more than one, then you have to add the URL by yourself. Step 2 Copy the URL of the Blip video and paste into Paste UR Click Download button . Step 3 Open the file when downloading successes. Tip: If the video or audio downloaded are not supported by your device, you can convert it into any formats supported by your player from under Convert button. 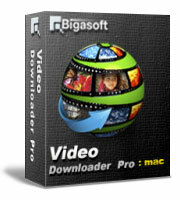 Bigasoft Video Downloader Pro is the best way to download Blip videos. Also, it can download videos from almost all popular video sites such like YouTube, Dailymotion, Vimeo, Goear music, Metacafe, Break, Veoh, BBC, Youtube, Hulu, CBS, etc and convert them to any video formats to make sure that we can enjoy the videos on Mac, iTunes, QuickTime, Apple TV, iPad, iPod, iPhone, Kindle Fire, Android and more.